Well... not really, but we've had some cool weather the last few days which is putting me in the mood for Fall! We have had enough heat this summer, which is usually my favorite time of year, that I am ready for hoodies, moccasins, bon fires, Halloween, comfort food, & everything else that comes along with the Autumn season. I can't wait to fill the new house with fall decor! I found some really cute things on Pinterest that I want to try... check out my "Seasonal" pin board. Also, I found this Family Circle magazine in the bathroom at work. 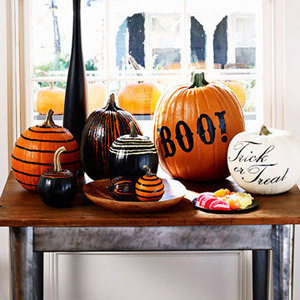 It's from October 2011, but it has some really cute Halloween decorating ideas & the great thing about it is you can find their templates and instructions online. Here is the link to some Halloween Fun! I love the idea of painting pumpkins, a lot easier than carving, which is fun & messy, but I think I will be trying something new this year. This weekend we are going to Mark Day's on Saturday night. It's supposed to be pretty cool out. Looking forward to chaps & leather jacket... also a big part of my fall wardrobe. We are ALMOST done with the house! I am hoping to post before and after pictures on my next post. I should be able to get photos of everything this weekend. I can't wait to post pictures & of course I will be hosting a beginning of Fall, end of Summer, bonfire, housewarming party hopefully some time in September. Probably the weekend of the 29th because we seriously have plans every other weekend, between labor day weekend, weddings, bridal showers, & our 1 YEAR ANNIVERSARY, every weekend in September is booked, might as well book the last one. Nothing new in the world of baby-making. Still trying & keeping our fingers crossed every month. It's been more of an afterthought as of late as stated in my last post due to all the craziness of moving. The dust will be settling soon (or the dust will be cleaned and vacuumed up soon) and we will get back into our normal routine, which I am sooo looking forward to. I am so trying that recipe!! YUM! It's sooooo amazing! You will love it, the guys love it too!